There may still be more than a month to go until Halloween, but the desserts are out in force. The best of the bunch go for visual appeal, with cakes and sweets shaped like spooky staples. Few places do Instagram-readiness quite as well as Q-Pot Cafe in Omotesando, though. Its 2018 lineup includes a cranberry soda served with an oversized syringe (¥750) and a ghostly hazelnut mocha with sugar capsules (¥750). 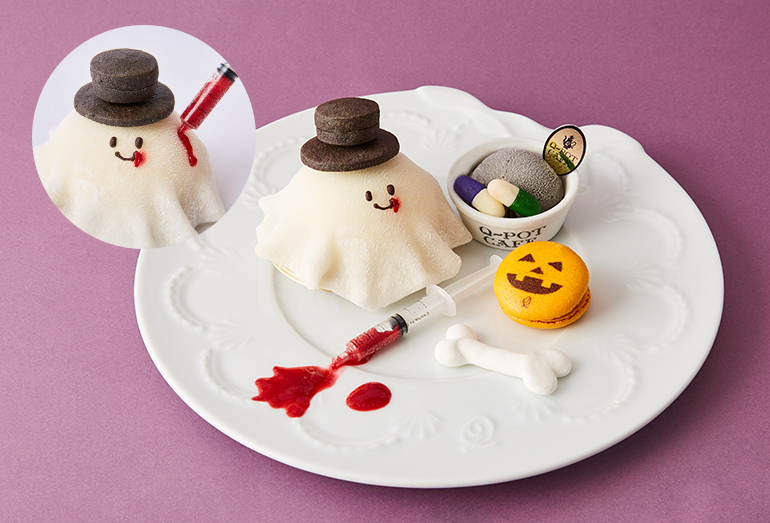 But if you really want a photogenic treat ahead of Oct. 31, go big with the Obake-chan QQ Medical Treatment Plate (¥2,060). 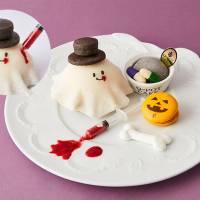 The main draw is the ghost-shaped cake, which features a sweet vanilla mousse. What elevates it to the next level is a raspberry sauce served in a syringe, allowing you to inject as much of the red stuff as you want into the cake. Go heavy, because the tartness balances out the vanilla well. The other additions are fine — the pumpkin-shaped macaron makes for a nice closing bite — but focus on the ghost.